Four British women who were liberated from a punishment institution in Somalia were each charged £740 (€820), The Times newspaper revealed. 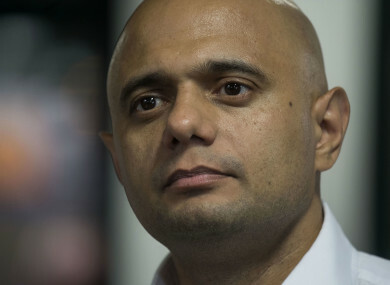 Home Secretary Sajid Javid who has vowed to do more to combat forced marriages. BRITAIN IS CHARGING young women rescued from forced marriages abroad for the cost of their repatriation, The Times newspaper revealed today. Four British women who were liberated from a punishment institution in Somalia were each charged £740 (€820), the paper said. Victims are reportedly told they have to fund their flight back to Britain, basic food and shelter costs. Those who are aged over 18 and cannot pay have to sign emergency loan agreements with the Foreign Office. The ministry helped bring back 55 forced marriage victims in 2016 and 27 in 2017. The four young women who were found in a “correctional school” in Somalia had been sent to the religious institution by their families and reported being chained to the walls and whipped with hosepipes. Some had their legs shackled, spent days locked in a small box, were burned with hot sticks and forced to sit in their own urine unless they accepted a forced marriage, The Times said. The Foreign Office and the Home Office interior ministry run the Forced Marriage Unit (FMU), which from 2009 to 2017 gave advice or support to nearly 12,800 people. Marriages without consent, or their refusal, have led to suicides and so-called honour killings in Britain, with several cases coming to national prominence. Since 2014, forced marriage has been a crime in Britain carrying a maximum seven-year prison sentence. In the past two years, the Foreign Office has lent £7,765 to at least eight forced marriage victims who could not pay for their repatriation. Around £3,000 has been repaid, although debts of more than £4,500 are outstanding. A 10% surcharge is added if an emergency loan is not repaid within six months. “Given these are from public funds, we have an obligation to recover the money,” a Foreign Office spokesman said. The FMU provides funding for safe houses and non-governmental organisations to ensure victims of forced marriage can get a place of safety as soon as possible. We do not charge British nationals for this service and work with organisations to support them on their return. Speaking from Singapore, Foreign Secretary Jeremy Hunt told BBC radio he had asked for advice from officials in response to the front-page story. “Any interventions that I have had on these consular matters I have always stressed to embassies and posts abroad that they need to use discretion,” he said. Of course we should always behave with compassion and humanity in every situation. News of the compulsory charges has prompted criticism in Britain. Yvette Cooper, who chairs parliament’s Home Affairs Committee which scrutinises the interior ministry’s work, said she was “completely appalled”. “Forced marriage is slavery. For government to make victims pay for their freedom is immoral. Ministers need to put this right, fast,” said the opposition Labour MP. In 2018, the FMU gave advice or support related to a possible forced marriage in 1,196 cases, with 256 (21%) concerning men. “Forced marriage is a hidden crime,” the unit says, explaining that the figures will not reflect “the full scale of the abuse”. In 2017, 37% of cases related to Pakistan, 11% to Bangladesh, 8%to Somalia and 7% to India. Some 10% were entirely internal British cases. The number of cases relating to Somalia has increased 100% year on year, the Foreign Office said. Email “Britain found charging women rescued from forced marriages to return home”. Feedback on “Britain found charging women rescued from forced marriages to return home”.